In this March 3, 2011 photo provided by NASA, inside the U.S. lab Destiny, 12 astronauts and cosmonauts take a break from a very busy week aboard the International Space Station to pose for a joint STS-133/Expedition 26 group portrait. 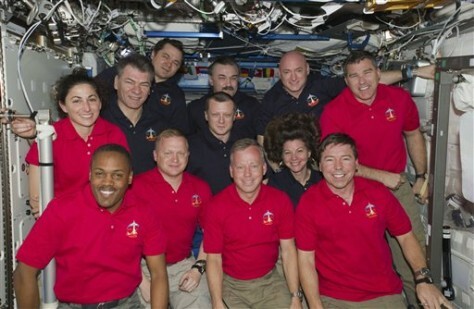 The STS-133 crew members, all attired in red shirts, from left, are NASA astronauts Nicole Stott, Alvin Drew, Eric Boe, Steve Lindsay, Michael Barratt and Steve Bowen. The dark blue-attired Expedition 26 crew members, from left, are European Space Agency astronaut Paolo Nespoli, along with Russian cosmonauts Oleg Skripochka, Dmitry Kondratyev, below, and Alexander Y. Kaleri and astronauts Scott Kelly and Cady Coleman, below. Serving the STS-133 and Expedition 26 missions as commanders were Lindsay and Kelly, respectively.